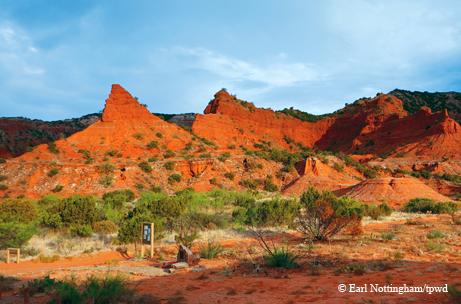 ﻿﻿﻿Caprock Canyons offers dramatic vistas for hikers seeking solitude. ﻿﻿﻿﻿Caprock Canyons is an afterthought. Since we will be out that way, at Palo Duro Canyon, why not stop by the other state park nearby, the one we’ve never heard of before? Oddly, even our friends who are from the Panhandle have never been to Caprock Canyons. But my family and I like out-of-the-way places — the middle of nowhere, the back of beyond, the end of the road. And Caprock Canyons State Park certainly seems to fit that bill. We have come from two days in Palo Duro State Park, and take the scenic route, driving up through Amarillo and then down Texas Highway 207 from Claude. The countryside around Amarillo is flat and, of course, yellow. For miles, we pass nothing but cotton fields and ranches. A few calves stand in the road, having squeezed through a break in the fence. That is all. Flat, flat, flat — as far as the eye can see. Then, quite suddenly, the road falls. And falls. Into a deep canyon. Rocks, trees, the very earth carved into waves and curves and pillars by wind and water and time. A complete surprise, a revelation. At around 2 p.m. we pull into Turkey, population 494, and locate the Turkey Hotel, where we will stay for the next two nights. We have walked into a time capsule. The Turkey Hotel was built in 1927. Filled with antiques and just plain old junk, it exudes character. Each room has a themed decor: military, hunting lodge, railroad and Gone With the Wind. 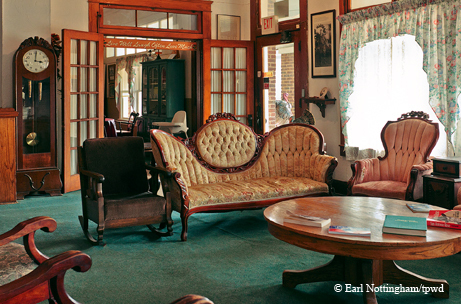 We are staying in the Western Room, decorated with barbed wire and memorabilia about hometown boy Bob Wills. There’s no time to poke around the old hotel. We have a date to go horseback riding in Caprock Canyons, and we are already late! My husband begs off, but my 8-year-old son and I head out to see if we can catch up with Tomas Hinojosa, the owner of the Quitaque Riding Stables. The stables are empty, so we continue to Caprock Canyons State Park and ask the first person we see, a park ranger, where we can find Tomas, the horse guy. “I know right where you can find him,” says the ranger. “Follow me.” And rather than just giving us directions, he jumps in his pickup and leads us to the Wild Horse Campground. The elusive Tomas, however, is gone. The helpful “ranger” introduces himself. He is, in fact, park Superintendent Donald Beard, and he offers to personally show us the sights. We climb into the big white pickup and are treated not only to a tour of Caprock Canyons, but also to Beard’s grand vision for the park. Beard, who came to the park a few years ago, envisions the 15,000 acres restored to the time before the bison were hunted to the brink of extinction, before the sea of grass they roamed was invaded by cedar, mesquite and prickly pear. 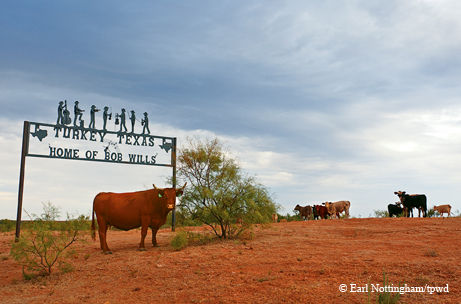 Caprock Canyons is home to the Texas State Bison Herd. This herd grew from a handful of bison that rancher Charles Goodnight — at the behest of his wife, who could not bear to hear the plaintive cries of the orphaned bison calves out on the plains — protected from the buffalo hunters of the mid-1800s. These rescued bison roamed the canyons of the JA Ranch until the state rounded them up and brought them to Caprock in 1997. Today the bison graze peacefully in the park, where they are thriving. However, Beard is not content with a thriving herd. He wants a thriving wild herd, free to roam the canyons. 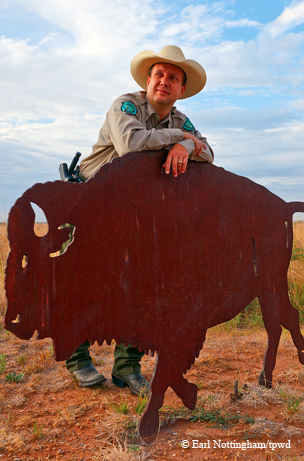 The plan’s two main goals: to restore the grasslands on which the bison historically lived and to fence the entire park. Cedar, mesquite and prickly pear have taken over since the introduction of the longhorn, and we’re talking about 15,000 acres to be fenced. Not a small task. While Beard works to restore the grasslands through controlled burns that will eventually weed out the invasive species, he has fenced 700 additional acres of prairie in the park for the bison. Bison were released there last September. Beard also plans to bring back antelope and prairie dogs. As we drive, Beard points out that, unlike Palo Duro Canyon, Caprock Canyons is unmarred by power lines and structures. There is no water or electricity down at the bottom of these canyons and only composting toilets. “It looks the same as it did centuries ago,” says Beard proudly, “minus the paved roads, of course.” He laughs. The next morning we hit the Lower Canyon Trail by 9:30. The rented horses are willing and keep up a brisk pace in the cool air. The morning sun lights up the red rock walls and illuminates the tall grass along the Little Red River, where the dry river bed is dusted with the gypsum that creates white striations in the canyon walls and clouds the local drinking water. The gypsum was left in layers by ancient seas that covered and retreated from this area time and again. Coveys of quail start up as we pass, and songbirds flute the air. After a pleasant morning ride, we picnic by peaceful Lake Theo. Golden and even bald eagles have been spotted here, but we do not see them. My son tries his hand at some fishing, but does not manage to catch any of the 2,000 trout with which the lake was stocked the previous winter. It is noon, after all, and this is only the second time my son has gone fishing. He fishes until the line breaks, tangled in some reeds. That afternoon, tired from riding and fishing, my husband and son decide to rest and explore Turkey. I, however, want to hike. We make a deal. I will take the car, drive to the park and hike on my own, but I have to be back by 7, or they will call the Texas Rangers. I have four hours, and I want to make it to Fern Cave on the Upper Canyon Trail, a hike that is described in park literature as “extremely steep and rugged.” I’m going to have to hurry. I arrive at the trailhead at 3:45. I reckon that I can hike until 5; at that point, I’ll have to turn around if I want to make it back to Turkey by 7. The sun is still high in the sky, and it is hot as I start out on the wide, sandy trail. For the first couple of miles, I hike through the cedars and mesquite that Beard wants to get rid of, glad for the small shade they provide. I see a few college-age kids headed back toward the trailhead with their camping gear, but once I pass the South Prong Primitive Camping Area, I am alone. It is quiet, save the scuttling of lizards and flitting of small birds through the brush, and I revel in the silence and solitude. After another mile or so of winding back and forth across the south prong of the Little Red River, the trail starts to rise and narrow. I climb, hiking as fast as I can because my time is running out. I use my hands to scramble up and between rocks. Occasionally, my boots slide on scree and I almost fall. My blood is actually pounding in my ears. At this point, I should be sweating buckets, but it is so dry that the sweat evaporates as soon as it hits the air. I pause to drink from one of the two water bottles I carry in my pack. There have been several signs on the trail warning hikers to turn back if they don’t have water. Wise advice. However, I do have water and I press on. Soon, the trail reaches an elevation and steepness that makes my stomach a vacuum when I glance down. You see, I am afraid of heights, and this whole cliff edge thing is a challenge for me. But I am inspired to try my best to make it to Fern Cave, where a ranger has promised that water bubbles from a spring and the air cools sharply. I pause briefly in the shade of a juniper that clings to the side of the canyon wall and enjoy a stunning view of the canyon. All around me rise the mesas, the waves, crenellations, chimneys and spires of red rock against the bright blue sky. Then, the sound of voices. The only other two hikers I’ve encountered since I passed the campground (and this is the middle of spring break) are coming down the trail from above. The trail to Fern Cave, they tell me, is about 10 minutes ahead. I look at my watch; it is five minutes until 5. I will not make it to Fern Cave today. I have to turn back now if I want to make it to Turkey before my family starts to worry. I don’t mind, though. It just means I’ll have to come back to Caprock Canyons someday. To see Fern Cave, and to see those bison roaming free over a rising sea of grass. I can almost see them now, as I sit perched beneath the juniper tree, the canyon spread out beneath me — a bison herd moving across the canyon floor like a shadow, splashing through the Little Red River, at “home on the range” once more.